Some foldable duffel bags are better than others, so it's important that you spend some time comparing the different options before you choose your new bag. The quality varies quite a bit from brand to brand - and you also need to make sure you choose a bag with the right size and the features you need. Having checked thousands of foldable duffel bag reviews, we can say that the The North Face Flyweight is the best choice for most people. The The North Face Flyweight got a rating of 4.30 out of 5, while the average rating in the list below is just 3.66. 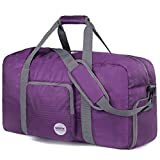 This is the best reviewed foldable duffel bag. We have checked 6,146 foldable duffel bag reviews, so we can show you the weighted average rating of all the bags. If the The North Face Flyweight isn't your style, you might also consider the WANDF Foldable. The Foldable is a close runner-up with a rating of 4.15 out of 5. The second-best reviewed foldable duffel bag. Finally, you might consider the Eagle Creek Cargo Hauler. The Cargo Hauler is the third-best rated foldable duffel bag with a rating of 3.84, but it's usually more expensive than both the Flyweight and the Foldable. The third-best reviewed foldable duffel bag. Below is the list of all top 8 best foldable duffel bags. Great if none of the three bags above are your style. PS: We have checked 6,146 reviews to make this top 8 list! While duffel bags can be one of the most versatile and useful types of luggage, they can still take up quite a bit of space. So, if you are roughing it out or just don’t have all that much storage room at home, you are going to need something that is a little more flexible. Here, foldable duffel bags are precisely the piece of gear that you need with you. Since this type of bag is quite a bit different to what you are used to, it can be confusing to know what you need to look for. This is why we set up this guide with all of the features that you need to know about. This way, you will find it an absolute breeze to pick up your very own foldable duffel bag. While foldable duffel bags have been around for a while, it is not surprising that you may not have heard too much of them. For the most part, they have typically used by hikers, campers, and people who head out on foot in rougher conditions. These days, however, travelers are beginning to use this type of bag more frequently as well since they offer up a lot of advantages. Of course, not all foldable duffel bags are created equal so you should be able to distinguish the good from the bad. In this guide, we prepare you to be able to do precisely this. These are all of the details that you need to know to choose a great foldable duffel bag. Most people are surprised to learn that there are structured and unstructured duffel bags. This is because most duffel bags tend to be quite lightweight and non-rigid anyway so it is easy to assume that there isn’t a difference. Structured duffel bags tend to be able to hold their shape even when they are empty. Also, the sides and the base of the bag will feel more rigid. Usually, when packing a structured duffel bag, you will realize that there are is a certain limit to how much you can pack. The frame prevents you from being able to place too many items in the bag. Conversely, an unstructured duffel bag doesn’t contain such a framework. While the seams of the bag are thick and rigid, the bag can easily be folded over when it is empty. You are able to fit more things in this type of bag as certain models to have expansion features. This type of duffel bag is also quite light in comparison to the structured version. Despite the lack of a rigid framework, these bags are available in all shapes and sizes. Folding and Collapsible – What’s the Difference? Now, these two terms may seem synonymous but when discussing duffel bags, there are a few differences present. A folding duffel bag is one that has a bit more structure. Due to this, there is a threshold for how much this bag can be compacted. So, while they can be flattened and folded, they may still have a distinct shape or volume. A collapsible duffel bag, on the other hand, practically has no frame at all. This is why it can practically be packed down an incredibly tiny shape. In fact, most of these bags can be made so small that they can fit into tiny pouches. This is why a collapsible duffel bag is also known as a packable duffel bag. When deciding between these two types of foldable duffel bags, you will need to think about how you will be using either bag. If your sole purpose is to have the lightest possible bag and then be able to store it so that it is essentially unnoticeable, then the packable duffel bag is the one for you. Nonetheless, if you still want some form of protection for your belongings or don’t want your clothes to get crushed, then some structure will be useful. Here, the folding duffel bag will be the best possible accessory. Most foldable duffel bags tend to run in larger sizes. As mentioned, many of these bags are used for camping and expedition purposes. This, however, is why this type of duffel bag comes in so handy as a travel bag as well. Small Bags (30 – 50 liters): bags within this volume range work well for weekend trips as long as you are only taking a few bulky items along with you. Medium Bags (55 – 75 liters): these bags are ideal for multiple day trips and carry slightly larger pieces of gear or electronic devices as well. Large Bags (75 – 200 liters): these bags are typically reserved for expedition trips. If you are traveling, though, you should be able to carry clothes and other items for about a week in these bags. Just because your foldable duffel bag doesn’t contain much of a framework doesn’t mean that it can’t be durable. If you are carrying heavy items in your bag or carrying this type of bag into the wilderness with you, you need it to be able to withstand certain conditions. One of the first things to take into consideration is the material. It is important to find a good balance between weight and durability. The two most commonly used materials are nylon and polyester, with nylon being a bit stronger than polyester. The main advantage with polyester, however, is that it weighs a bit less. Nevertheless, the material that you choose should have abrasion resistance qualities. This will prevent the material from wearing away too quickly due to constant friction with other surfaces. If you want a bag that will not rip too easily, you should look at ripstop nylon or polyester. These materials prevent rips and tears from spreading, allowing the bag to maintain its durability for longer. Of course, the stitching of the seams can also come into play when examining the durability of a foldable duffel bag. You will need to ensure that the seams have at least double stitching so that they are capable of taking on a heavier load. The most common method is two handles that meet in the middle with a padded cover to keep them together. This foldable bag design also comes with a shoulder strap too. This is a good option if your duffel bag is quite long and it would be cumbersome to attempt to carry it any other way. In this case, it will be most comfortable to carry the bag parallel to the ground. These bags, however, are best utilized for lower weights. Since there is no way to really balance the bag, you can get quite tired, hauling around a heavy load. Also, when examining the shoulder strap make sure that it has plenty of padding and that it can be adjusted to your height. There are also plenty of foldable duffel bags that have backpack-like straps. These allow you to hoist the duffel bag onto your back. Sometimes, they are removable so that you can adapt the bag to whatever design that fits the environment. The advantage of these bags is that they are a great deal more comfortable to carry, especially with heavier cargo. You can distribute the weight between both your shoulders so it will not feel as heavy. The key to these straps is a good width and plenty of padding. To ensure that your movement is not restricted, you should look for a duffel bag with adjustable straps. So, what are some of the other features that you should know about when choosing a foldable duffel bag? Most foldable duffel bags have a large, main compartment where you can store the majority of your items. Nonetheless, it can be useful to have several additional pockets or compartments to separate some of your belongings. This can help to keep the bag more organized. If this is what you are looking for, internal compartments will work best for you. At the same time, pockets are also great for separating clean clothing from soiled ones, so external mesh pockets, for instance, can be great for storing wet clothes or muddy shoes. Mesh pockets on the outside can also be great for holding a variety of objects. Now, it does depend on how you use your foldable duffel bag, but it can be handy to have one that is made from a material that is impervious to the weather. At the very least, you may want to think about getting a bag that is made from water resistant material to keep your belongings dry at all times. Here, you should look for nylon or polyester with water resistant coatings such as polyurethane. While these may not work in a downpour, they should help you out during a drizzle or damp conditions. If you are more worried about the sun stripping your bag of its protective coating and color, then you should look for UV resistant materials. This will prevent your foldable bag from fading out and perhaps, even wearing away too quickly. The best way to protect the items in your bag is to make sure that they are secured and are in place. This is particularly important if you are hauling around breakable items. Here, compression straps are quite useful. Once the bag is packed and closed up, the straps will make sure that the structure of the bag is maintained. This way, the items inside are unlikely to move around during transit. So, this is all that you need to know about selecting a foldable duffel bag for yourself. All of these guidelines will help you to identify potential models quicker and ensure that you make a good investment. Classic foldable duffel bags and models that haven't yet got enough reviews to be ranked. List ID 75. Images from Amazon Product Advertising API and shop datafeeds.